Rebecca Webb Pennock was born on January 6, 1794 in Fallowfield, Pennsylvania. Her mother's name was Martha Webb Pennock. Her father's name was Isaac Pennock. Isaac's father was a farmer. Isaac had started an iron works. It was called the Federal Slitting Mill. This mill made iron rods and strips of iron. These were used to make rims for wagon wheels, barrel hoops, and nails. They were also used by blacksmiths to create other things. The family owned a large amount of land in Chester County. By the time Rebecca was born they had plenty of money and a comfortable home. Rebecca's parents were Quakers. Her father believed that girls as well as boys should learn to read and write. He taught her these skills himself. He also taught her to work with numbers and to ride a horse. When she was not studying or spending time with her father at his business, she was allowed to do as she liked. Rebecca often wandered around the countryside, enjoying nature. From time to time she would spend a week at her uncle's house. Three cousins, older than Rebecca, lived there. They paid her much attention and taught her many things. When Rebecca was 12 years old she was sent to boarding school. After one year, she settled in at a school in Wilmington, Delaware. Rebecca loved going to school. She had many friends. She especially loved her teacher, who combined his Quaker faith with his knowledge. He taught Rebecca both about the world and about her God. At the age of 16 Rebecca returned home. By this time she had four younger sisters and two younger brothers. Her mother wanted her to learn how to care for children. She also needed help with her large family. Rebecca was put in charge of the baby. She did not like taking care of him at first, but soon grew to love the little boy. Rebecca missed going to school. She read everything that she could find. Often she read at night in her bedroom. Rebecca asked her father to let her go back to school. She was allowed to go back to school in Wilmington. She studied chemistry and French with her old teacher. While Rebecca was in school, her father started a new business. He went into partnership with a man named Jesse Kersey. Isaac bought some land on the west branch of the Brandywine River on July 2, 1810. He made an old sawmill into an iron mill. The partners named it the Brandywine Iron Works and Nail Factory. In the Spring of 1812 Rebecca went to Philadelphia with her father. She met a doctor named Charles Lukens, who had a large practice in Abington. Rebecca liked him very much. Doctor Lukens came to visit her several times at her home. They were married at the Friends Meeting on March 23, 1813. The newly married couple moved to a house near the Federal Slitting Mill. In 1813 this mill was given a new name. It was called the Rokeby Iron Works. In 1814 their first child, Martha, was born. Charles Lukens decided to work with Rebecca's father at the Brandywine Iron Works. He worked in the iron business for two years. Charles was not sure that he liked the iron business. He thought that he would like to go back to his medical practice in Abington. Isaac may have wanted him to stay. In 1816 Isaac bought Jesse Kersey's part of the business. He leased the business to Charles Lukens for $420.00 per year. Charles and Rebecca moved to a large farmhouse near the mill. It was in poor condition. The mill needed a lot of work, too. Rebecca worked in the house, and Charles worked on improving the mill. The United States at this time was developing more industry, and many businesses were using steam machinery. The machines ran on steam from water that was heated in iron boilers. These boilers were made from flat pieces of iron called boiler plates. To make boiler plate, the iron needed to be rolled. Charles made changes to the factory so that they could roll iron plates. In 1818 the Brandywine Iron Works was the first iron mill in the United States to roll iron boiler plate. The factory also rolled steel plates. Steamboat manufacturers ordered rolled iron to build the hulls of their steamboats. The steamship Codorus, which was the first steamboat on the Susquehanna River, was built with iron from the mill. Rebecca and Charles had three more children. Elizabeth was born in April 1817, and Charles Edmund was born in February 1819. In May 1821 Isaac was born. He was not a healthy baby. Baby Isaac died in March 1822. Rebecca's father, Isaac Pennock, died in 1824. He had told Rebecca that the mill would be left to her, but his will did not make that clear. Rebecca's mother tried to take over the mill that Rebecca and Charles had worked so hard to make into a good business. Not long after Rebecca's father died, her son Charles Edward also died. Then Charles Lukens died suddenly in 1825. He was 39 years old. Rebecca was 31. Rebecca had three small daughters to care for. She was also expecting another child. Rebecca knew that she had to take care of her children. Charles had asked her, before he died, to keep the mill running. She decided to be brave and to run the mill herself. Rebecca's last child was born 5 months after her husband died. She named the baby Charlesanna in honor of him. Rebecca’s family did not want her to run the mill. The mill owed money, and still needed improvements. However, Rebecca was a good businesswoman. She took over as the owner and manager. Rebecca was the person who made the contracts and handled the sales. She was responsible for buying all supplies and materials. Her husband Charles’s brother Solomon took over the operation of the mill. The very next year the first railway steam locomotive ran in the United States. Rebecca saw the chance for business, and her factory started making iron for locomotives. The quality of the plate was so good that some was even sold to factories in England that made railway engines. Under Rebecca's leadership, the mill prospered. After nine years she was able to pay the debts that the mill owed. She also paid her mother for her interest in the mill. Rebecca went to work at the mill every morning. This did not mean she forgot about her children. She loved them very much. She took time to tell them stories and take them on picnics. She took then on trips to the docks. She bought pretty cloth to make dresses for them. Rebecca's daughter Elizabeth died in 1832 at the age of 15. Rebecca was so sad that she put all of her energy into her work. She remodeled the whole mill, putting in new castings, wheels, and furnaces. She repaired their house. She built homes for her workmen. She also fought those who did not want her to have access to the river. In 1834 Rebecca built a store and a warehouse. She set up a freight stop at the Coatesville railway station. This meant that her factory could sell to companies in Philadelphia and Pittsburgh. Boiler plates were sold to build Baldwin locomotives. Some were sent to New Orleans. They were used to build river boats for the Mississippi. In 1837 a depression started that lasted 6 years. It was called the Panic of 1837. Many businesses failed. Rebecca refused to lay off workers. She used them to do repairs to the machinery and build walls. They worked on her farm. When there was no money, she paid them with dairy items, farm produce, and meat. In the 1840's the government put charges on all manufactured items that were delivered by train. These charges were called tariffs. Rebecca fought against these tariffs. She said they were unfair to her business. Rebecca had three children who were still living. All three were girls. 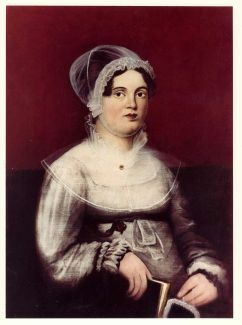 Martha married Abraham Gibbons, Jr. in 1841. Isabella married Dr. Charles Huston in 1847. Both of these men joined in the family business. Now Rebecca could take a less active role. In 1848 Rebecca's youngest daughter, Charlesanna, married Dr. William Tingley. Soon they were expecting their first child. When the baby was born, Charlesanna died. Rebecca took the baby, named Annie, home with her. In 1849 she stepped down as manager of the mill. She was still very busy. She was building a house for Isabella. She was lovingly raising baby Annie. The court case over Isaac's will was finally settled in 1853. On December 10 1854 Rebecca died. She was buried near Fallowfield Friends Meeting. Where we see her name today. The mill is still in operation. It is the oldest continuously operating steel mill in North America. Rebecca's family renamed it the Lukens Mill in her memory in 1890. It is now called Lukens Steel. On the front of the Chester County Courthouse there is a carving. It commemorates nine "founding fathers" of the area. Rebecca is included. She is listed as "Rebecca Lukens, Ironmaster." Reading Level 6.6. Picture of Rebecca Webb Lukens courtesy of the Stewart Huston Charitable Trust.